Waterfront Park is located on the Embarcadero right next to Pier 39. There is a grass area to play catch or have a picnic that is surrounded by trees. Waterfront Park is owned by the Port Authority. Muni access: Third Street Light Rail, 23rd and 3rd Street stop. 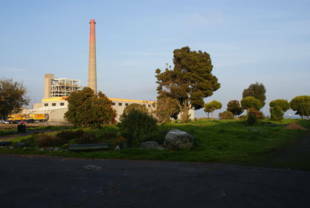 Owned by the Port of San Francisco and the Mirant Corporation (owners of the adjacent power plant), the two-acre park was established in 1976, according to David Beaupre, senior waterfront planner. From its beginning, the park and Cove, with its spectacular views of the Bay, have coexisted with and been damaged by homeless encampments, drug users and graffiti artists. The Homeless Church bus that held Sunday services for the squatters has now gone, but needles and trash remain. The wooden picnic tables, benches and the fishing pier have been burned several times, and graffiti ' artists' continue to tag, undiscouraged after their work is painted over. The long-standing cache of sunken tires in the Cove's water is still on view at low tide. In 2002, the SF Planning Department's Central Waterfront Neighborhood Plan noted that the park '. . . should be improved in order to attract the activity necessary to making Warm Water Cove a pleasing and safe destination.' 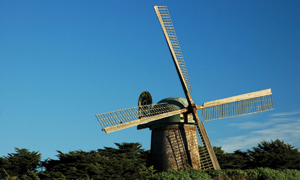 Most park users, from the adjacent Dogpatch and Potrero Hill neighborhoods, agreed. In 2004 the Port installed an accessible and unburnable concrete picnic table, paved pathways, and new signage. But today blogs and media stories about the Cove reflect contentious and ongoing problems. Periodic cleanups have had little lasting effect. Early this summer the Port, DPW and the community dredged up a mass of old tires, cleaned the grounds of brush and refuse, and repaved the paths. 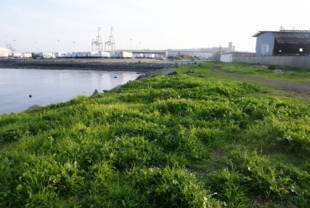 In August, a heavy duty cleanup team included the Port's Tom Carter, deputy director of maintenance; Mohammed Nuru, deputy director for operations, SF Department of Public Works; Merle Goldstone, public information officer for DPW community programs; Corinne Woods, Blue Greenway coordinator of Neighborhood Parks Council; and Project Connect. They marshaled 100 volunteers who picked up trash, trimmed trees and painted over the graffiti-covered walls. 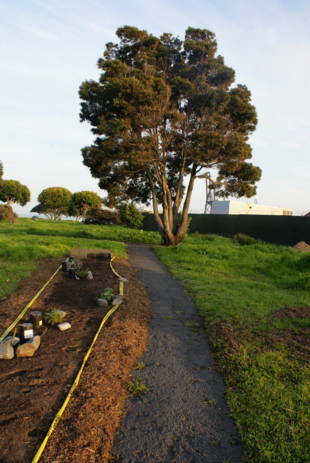 This effort may have a longer life because, says Carter, the Port's maintenance department, the SF Police Department and DPW are now monitoring the park on a daily basis. Susan Lavin, homeless coordinator in the Bayview Police Department, reports that over the last two years, the homeless count has gone from 30 or 40 to 1. Two families with young children have been moved into new three-bedroom apartments. One child, four years old, said she had never slept in a bed before. In October 2007, NPC's monthly coalition meeting featured a presentation by Mike Ernst, a graduate student in city planning and recipient of the first SPUR Piero Patri Fellowship in Urban Design. Mike set out his visionary land-use plan to expand and revitalize the Cove, integrating the adjoining neighborhoods- innovative concepts for the days of planning that are just ahead. 'We're preparing now for the long term future of Warm Water Cove,' Corinne Woods, NPC's Blue GreenWay Coordinator explains. 'In creating a master plan we will be meeting with managers of the Port, PUC, DPW, artists, dog owners, skate boarders, and other members of the community. The plan might include art, music and recreational elements.' Robin Talmadge of Potrero Hill is working with Supervisor Sophie Maxwell on a pilot off-leash dog park. 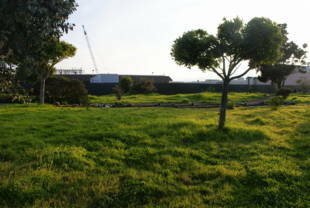 "'The Port has invested significant funds and labor over the years to encourage responsible park users. But without park stewards, the unlawful camping, dumping and graffiti will continue,' says David Beaupre of the Port. 'The goal,' Woods agrees, 'is to create stewardship. The 120 NPC ' Friends' groups work to maintain and improve their parks. It's the only way to protect their environment.' Clearly this orphan park needs to see a 'Friends of Warm Water Cove' in its future. The Embarcadero & Grant Ave.